From Rottenburg an der Laaber to Langquaid the Stork Route runs through the valley of the Grosse Laaber with stopping points around the Animal and Plant World. 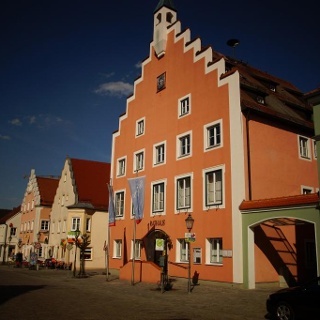 The Stork Route starts from the former railway station in Rottenburg an der Laaber. Leaving the town the route heads towards the Laaber Valley and via Schaltdorf to the first stopping point, just outside Högldorf. Here you can watch storks, herons and other water birds through a telescope. Near Alzhausen it’s worth making a detour to Rohr in Niederbayern where you can stop off and visit the Asam church. There is another option for taking a short break at Stop 3 at Rohrbach, where a photograph album shows pictures of previous floods. The route carries on via Laaberberg to Laaber. Shortly before reaching it comes the fourth stopping point, with comfortable recliners and information about amphibians. After passing the lookout tower at Adlhausen you continue towards Leitenhausen. 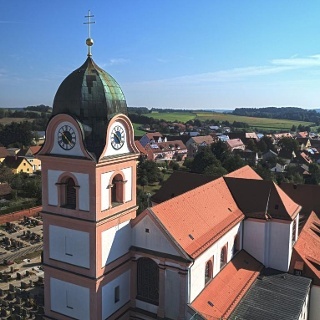 After Sandsbach you will come to Stop 6 at Siegersbach and you then carry on, turning off at the Appersdorf Chapel, through the Laaber Valley to Langquaid. At the edge of the town you can find out all about grassland birds at Stop 7 on the Stork Route. From the lookout tower you can enjoy the fine view of the Laaber water meadows and the stork’s nest near the roof of the town hall. The final point of interest for cyclists is Langquaid’s historic market square with its baroque houses. You will find Stop 9 at the open-air pool in Niederleierndorf. Here you can take a Kneipp cure in the Laaber and learn about the Laaber Valley Project. Passing the Niedermoor bei Niederleierndorf nature reserve you cross the Laaber Valley once more before reaching the start-and-end point of the Laaber Valley Stork Route at Eichbühl. Cycle paths on both sides of the Grosse Laaber Valley take you back to Rottenburg an der Laaber.